So, after checking the CEIL Recruitment 2018-2019 Notification all the interested people can actually start applying for the openings from 12th March 2018. Do not worry about the information. Because on this page, we are going to update each and every detail clearly for the sake of the people. Now, the officials of Certification Engineers International Limited released this new Notification. And it contains the complete information about the 139 Construction Engineers (Civil, Mechanical, Electrical, Instrumentation and Welding / NDT), Safety & Warehouse Vacancies. Therefore, all the people who are searching for the Central Government Jobs can make use of this golden Chance. CEIL is one the reputed Government Organization in India. And is looking for the hardworking and efficient people. So, if you are interested in working with the organization, then you can check this post. Accordingly, the Final date to submit the Application form is 22nd March 2018. 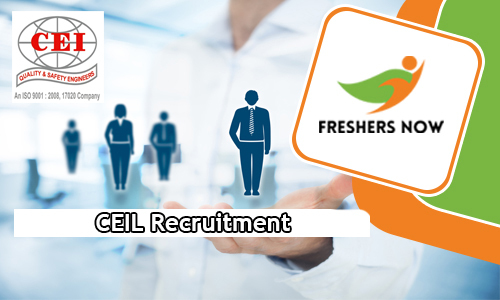 By checking this post about CEIL Recruitment 2018-2019 Notification, you will get to know about the name of the vacant positions, Number of Vacancies available, education Background, Age limit, Salary, Application Fee, Recruitment Rounds, Steps to apply and all other important details. We all know that many people are unable to find the genuine place to get the complete source. Therefore, to help all such contenders, here on this page, we are updating this post. And it contains all the important and mandatory details. All the contenders can check them and proceed to apply only if they are eligible to do so. Now, first of all, the candidates should know about the Educational Qualification. As per the information in CEIL Recruitment 2018-2019 Notification, applicants have to complete their Any Bachelors Degree / Engineering in Relevant Field from any recognized institute or University in India as Education. Our team has extracted some basic details from the CEIL Recruitment 2018-2019 Notification. And arranged them into a table. Therefore, please check them all. So, that you will have an overall idea of the mandatory requirements. All the contenders should keep this in view that many of the job hunters are losing many opportunities because of applying without any proper knowledge. Therefore, to help the people, here we have given the table. Check it out. And then continue to get more details about this CEIL Recruitment 2018-2019. All the applicants should and must remember that having the Educational Qualification as of on date of applying is quite necessary. If not the Officials will surely reject the applications of the contenders. Therefore, to avoid the discomfort situations while applying for the CEIL Recruitment 2018-2019 Notification, all the applicants have to carefully check the requirements. As per the information in the advertisement, correct age is also as important as the Educational Qualification while applying. According to the Notification, the Minimum Age can be 35 years. While the officials of the CEIL has limited the maximum age to 40 years. Apart from this limitation, the officials of Certification Engineers International Limited are also providing some age relaxation for the different category people. Therefore, please continue in checking this post or the advertisement to find out the Age relaxation information. All the participants should notice that we are only helping by providing details. They should recheck while taking a step ahead. Find out more other details by checking next sections of this article. While searching for the CEIL Recruitment 2018-2019 Notification, people are also curious to know about the application fee too. Well after checking the advertisement thoroughly we can say that there is no application fee, that is given in the advertisement. But it would be ideal for all the people, to check the Notification twice before making any kind of payment. And we hold no responsibility for that. Therefore, after checking all these requirements, the candidates should submit their filled application form before the final date. Then the officials of the Certification Engineers International Limited will analyze the applications. Now, all the eligible contenders will get called to participate in the Recruitment Rounds. And to attend those rounds, you all have to download the Admit Card from the official site. As per the information, to choose best contenders from all the applicants, Officials are going to conduct hiring process. As per the data in the CEIL Recruitment 2018-2019 Notification, applicants need to clear the Written Examination follows by the Personal Interview. Apart from these two, there are no other rounds, the people have to clear. But clearing these rounds is not that easy. Therefore, keep this in mind and prepare well for the tests. And our site Freshersnow.com all the contenders can check the Preparation stuff. These might help you all to crack the examination. Now, only the merit and performance in the exams are considered. So, be careful. And those people who will get a job will also get the monthly salary. Apparently, as Payscale contenders are going to get Rs.74,250 to Rs.1,05,160/- Per Month. This is just an outline. The salary will change for each and every position. You all have to check the advertisement which we have linked at the end of this post for the Post wise Salary details. And for the convenience of the contenders, at the end of this post, we are also attaching the Official CEIL Recruitment 2018-2019 Notification. Simply by clicking on it you can download the advertisement. Construction Engineer (Civil, Mechanical, Electrical, Instrumentation and Welding / NDT): Rs. 74250/- – Rs. 105160/-.